The flights up to this point had been what I call “routine”. 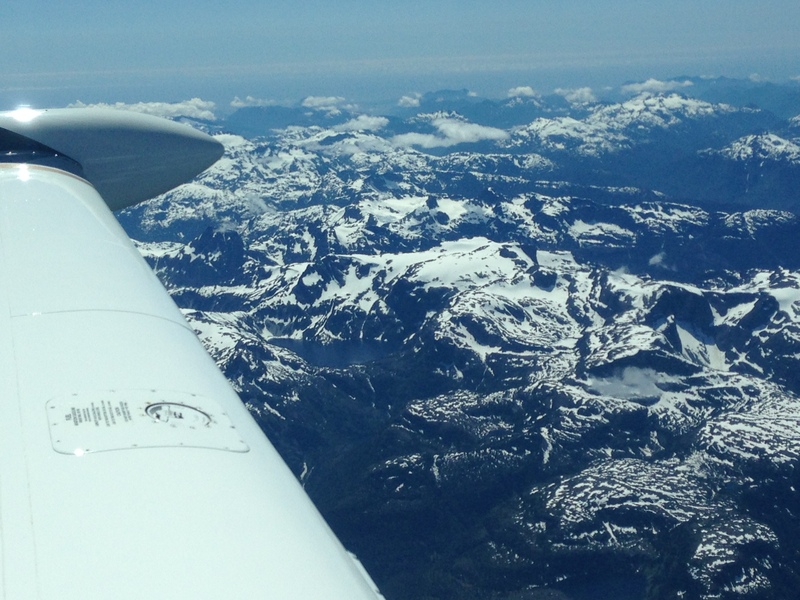 Read more about the flights from Rockwall, TX to Seattle HERE. When I say routine, I mean that I am on an IFR Flight Plan, in radar coverage, talking with ATC and receiving hand-offs to the next frequency, with XM Weather coverage, and controllers who have access to weather radar and pilot reports. The “routine” flying was about to end. After taking off, I was handed off to Seattle Departure and routed North. Crossing into Canada was not a big deal…just a handoff to Victoria Center. As I looked out my window and played my normal mind games of “where do I go if the engine quits?”…I found some of my most appealing landing spots were water. The terrain was simply unforgiving. My absolute best hope of a low G impact would be landing gear up on a lake as close to the shore as possible. Which, of course made me think about the emergency items I had brought along. This website provided us a clear list of what equipment we needed to have as part of our survival gear. We put everything in a small rolling suitcase that was strapped into the main cabin for easy access. Additionally, I had brought our DeLorme inReach that communicated with my iPhone. It provide a GPS track for our friends to follow and it also has a simple SOS system that will send for help. They can find the signal within 16′ of the locator. I literally had this either physically on my person or within easy reach at all times during our flight. It was some cheap insurance and looking out my window at the terrain, I was really glad I had brought it along. It quickly became clear that ATC north of the border of the Lower 48, was going to be a different experience. The ATC terminology is slightly different and they often handed me off to local controllers at airports along my route. Speaking of airports, there aren’t many along the Western Canadian coast. It’s hard to explain just how remote the terrain was…it became clear how much of my aeronautical decision making is assuming some level of civilization for handling emergencies. One of the other discoveries I made was that my XM weather lost much of it’s utility. In Canada, I had radar (by choosing Canada Radar on our 750) but I was never very trusting of it’s accuracy. 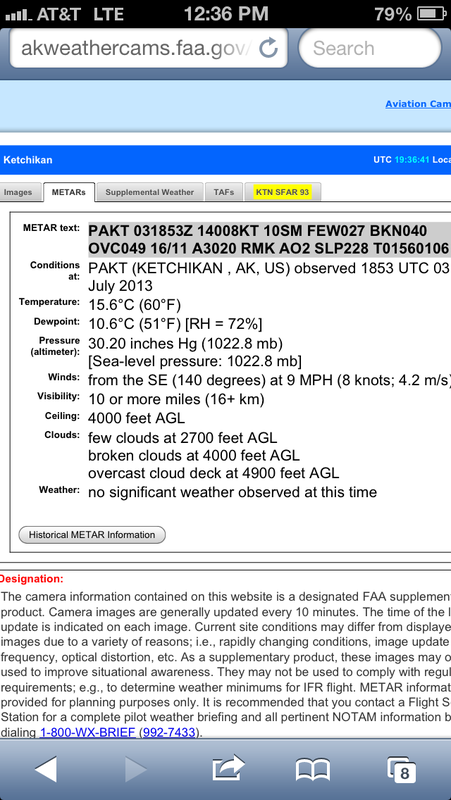 I lost METAR info for Alaska airports and never received any for Canadian airports. XM never claims coverage of it’s weather product in Alaska, and I can verify that it is nonexistent. We received XM Music consistently all the way north to 59degrees North, then the signal got a bit flaky. DO NOT depend on XM Weather for weather while in flight. One of the best thing the FAA has done is they have a boat-load of LIVE WEBCAMS for various locations all over Alaska. They literally have the clear day view with visual reference points of distance and height and the LIVE view beside the reference image. You can very quickly determine what the ceiling and visibility is using these cams. These cameras are so effective, it’s actually difficult to believe that the FAA created this program! 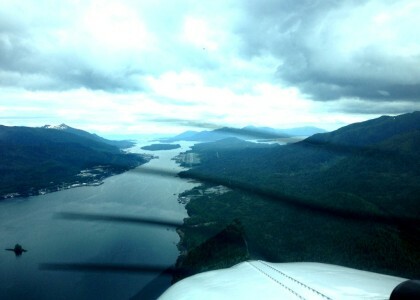 For our flight into Ketchikan, AK ceilings were reported as 2700′ Broken. I decided it was best to go ahead and shoot the ILS Runway 11 to have assured terrain clearance. There was a moment when I was tempted to break off the approach when I caught a glimpse of the airport through the broken clouds…but the steep terrain poking up encouraged me to be patient and fly the approach. You can watch my approach into KPAE and PAKT here. Ketchikan does not have a tower per se…they have a Flight Service Station that essentially acts as a guidance counselor for pilots. They help you see the traffic picture around the airport. There is no radar, it’s based on pilots all calling Ketchikan Radio and telling them what is happening. It’s sort of a blend of CTAF and a really easy-going Tower. The air traffic around Ketchikan is thick. The airport sits just to the West of the water and there is a significant float plane base right beside the airport, so there is plenty of traffic to keep up with. The only choice for an FBO is Aero Services. $7.00/gallon 100LL was pretty steep, but it sure beat dealing with Canadian Customs. Service was OK. It’s pretty clear they know they are the only game in town. Our plan was to overnight in Ketchikan. There is a ferry that takes you across the channel from the airport to the main part of town. We stayed at a really nice Best Western (I know…oxymoron) and they provided a shuttle van to pick us up from the ferry. There was a great restaurant that we all enjoyed. But, believe me, we were ready to not be in an airplane! My wife and kids wanted to celebrate! We had made it to ALASKA!! But…there still was another extremely long leg left to fly before I was ready to fully celebrate the win. South East Alaska Weather has a life of it’s own and low clouds and low visibilities are expected, even when not predicted. The next day would bring many challenges from the weather, so I am going to save that for my next post.